The incident occurred while Leeds were already 2-0 up, but if a foul was given by referee Andy Davis it could certainly have changed the game. Holmes had chipped the ball over two Leeds defenders before attempting to header over Peacock-Farrell. 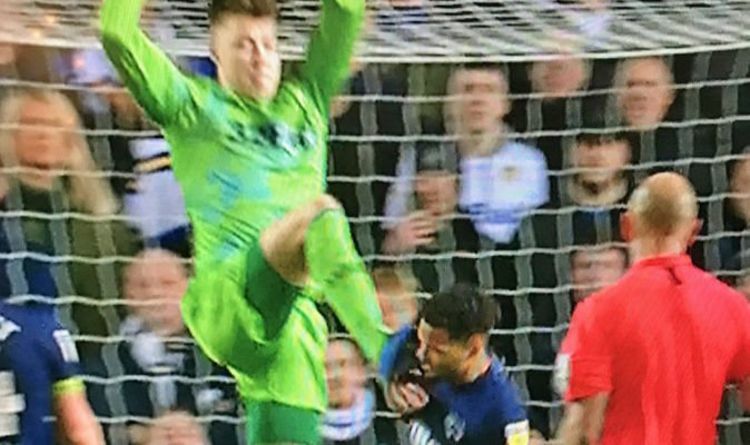 However, the Leeds goalkeeper jumped to grab the ball, before appearing to push his foot towards Holmes’ face. Surprisingly, the goalkeeper even looked to see Holmes before moving his foot studs up at the forward. Peacock-Farrell managed to escape receiving a card for the incident and was not punished whatsoever. Initially, it was believed that Davis had not seen the kick. However this image suggests otherwise, as Davis is seen to be facing the ball at the time of the incident. Leeds ran out 2-0 winners at Elland Road to go five points clear at the top of the Championship. But fans took to Twitter to call for a ban for the 22-year-old goalkeeper. “That has to be a retrospective ban for Peacock-Farrell. No way ref can say he saw that incident correctly – or if he did he should never ref another game again,” one wrote. “I’m a LUFC fan but that foul by Bailey Peacock-Farrell is about as bad ever you’ll see – he looked and then put the boot into the head. Certain ban to follow and should be 5 games, minimum. Red mist doesn’t even begin to describe it,” another posted. Derby boss Frank Lampard did not discuss the incident in his post-match press conference, however he did allude to a let-off for Rams defender Andre Wisdom in the first half. Wisdom laid into Ezgjan Alioski in the first 45 seconds, and Lampard admitted that if the incident took place before the linesman flagged for offside, it could have been a worse scoreline. “We’re lucky there because it would have been a penalty,” he said. “It was far away for us to see anyway but they started out of the blocks.